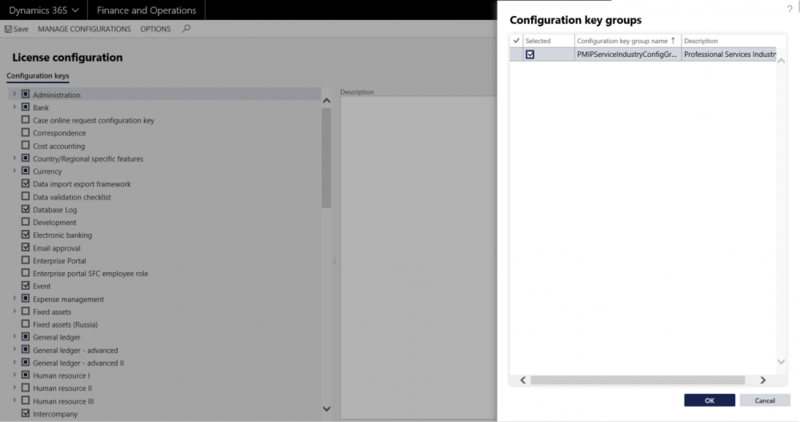 Projects+ provides the configuration keys to activate or deactivate certain Dynamics 365 Finance and operations features or modules out of the box. There are predefined keys containing the combination of modules which service industry often uses. This feature is designed keeping in mind the box implementations which in turn reduces the implementation timelines. License configurations allow activation and deactivation of certain forms, fields, and features based on the industry or country requirements. The License configurations form has been enhanced to allow for easy activation and deactivation of License keys based on one or more License key groups. A License key group has also been predefined to include configuration keys applicable for the service industry. This feature can easily be extended by creating new License key groups. It is best practice to set the keys prior to going live in Dynamics, or prior to a complete regression test of all processes.